Which SSL Is Best For A Better Boost In Google SEO Rankings? Certs 4 Less Answers… What Is Always On SSL? Always On SSL is a mechanism for ensuring that every interaction with every page of your website is encrypted from the moment a visitor arrives to the moment they leave. This goes beyond using SSL on transaction pages, like sign in and payment portals. Moving from an "http” site to a fully “https” secure site is the only way to 100% ensure that every interaction with every page of your website is completely encrypted—from the moment a visitor arrives to the moment they leave. Protecting login and transaction areas alone doesn’t prevent hackers from stealing the cookies that store a user’s session. If those cookies are stolen, attackers can use them to recreate a website session and gain access to all kinds of sensitive data—over and over again. 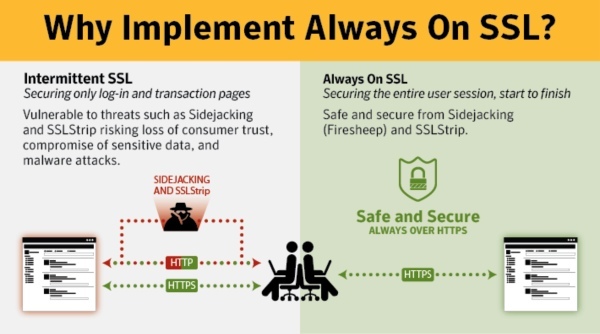 Slidejacking (using Firesheep) and SSL Strip are common types of attacks that prey on vulnerable sites with limited security. In the end, unprotected pages and their associated cookies negate any effort and expense put toward protecting login and transaction areas with Intermittent SSL. Install a site-wide SSL certificate to increase SEO rankings and user trust. Google has recently announced that installing an SSL Certificate is one the simplest things that website owners can do to boost SEO rankings. Now the question that website owners, administrators, service providers, and now SEO experts, is: “What SSL Certificate do I buy? “ The Google search boost for utilizing SSL applies to all websites, whether they ask for personal and/or private information or not. This means that even if your website doesn't have a checkout page, any login pages, or any financial or sensitive personal information, you can still realize SEO benefits by installing an SSL Certificate on your site. “Why Should I Use an SSL Certificate on My WebSite?” It’s Simple… SSL is used to create a secure data transfer session whenever website visitors enter credit card details or other sensitive data like login credentials, financial and/or personal information. You want your website to guarantee to your customers or visitors that their sensitive information is secured and SSL certificates are the most reliable form of data security online today. SSL certificates also provide (VTIs or Visual Trust Indicators) such as the green address bar from EV (Extended Validation) SSL certificates, the lock symbol on the browser showing that the connection to the particular website is secure, and trust seals that indicate that the website owner has been verified and that their SSL certificate is still valid. Single Domain Name SSL Certificates are Perfect for Small Businesses, Blogs and Personal Websites Google encourages all websites to secure visitor information via SSL certificates. This means that whether your website collects personal information or not, Google will reward websites with installed SSL certificates with a boost in search ranking. A single-name SSL Certificate like the GeoTrust QucikSSL Premium is the ideal SSL solution for small business owners, bloggers, and for personal websites. A GeoTrust QuickSSL Premium certificate secures one domain, making sure that any information a user accesses on your website stays totally private and secure from any third parties. Aside: A GeoTrust QuickSSL Premium certificate also means that you can secure your website with the www and without in front of your domain name. So whichever way your users type your website’s domain name in their browser bar, with or without the www, you can be assured that they’ll know your website is secure. Multi-Domain SSL Certificates offer Service Providers, SEO companies, or Website Administrators a way of Securing Multiple Domains. Here’s How… In many cases, larger websites and online service providers often require more than just a single SSL certificate to secure their website. A) They may have multiple websites. B) They may have several different domains to secure. Service providers often secure customer websites or provide services for businesses and need to secure those portals for their own customers. Should SSL Be Part of Your SEO Solution for Your Website? You Bet. While we all know that building link-backs and verifying on-page content for an increase in SEO rankings requires time and effort, getting an SSL Certificate is quick and easy and the SEO boost is immediate. With Google wanting to encourage a safer Internet by giving an SEO ranking boost to sites using SSL, now is the time to purchase an SSL certificate and take advantage of an easy way to get your site above your competitors.